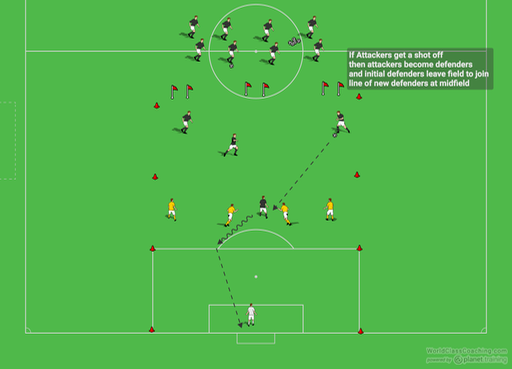 Here is a great drill to get a lot of players involved in match like attacking situations. One grid is set up in the front third of the field using a full half field. The grid is set with the width of the 18 yard box making the width of the grid 44 yards. 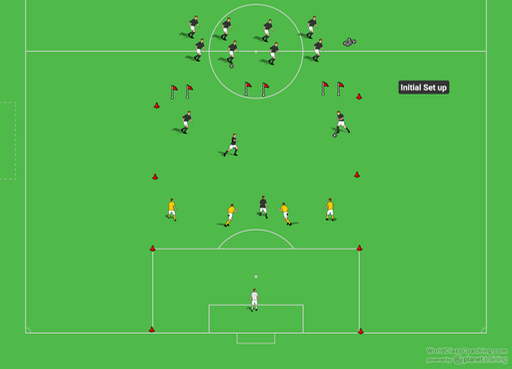 Four players come from the midfield stripe or a bit closer as shown in the diagram and attack a group of four defenders who are positioned deep in the field in a zonal defense shape. If the attacking team is successful in getting a shot off either on goal, over the end line or to the keeper’s hands, the attacking group becomes the defending group and a new group of four come from the midfield stripe to attack the newly appointed defenders. However, if the defending group is successful in cutting out the attacking group and gaining possession, the defensive group attempts to score on any of the three small goals at the opposite end. If they are successful in scoring on the small goals then the defensive group gets to stay on the field and defend again. If they are not successful in scoring they come off the field and the initial attackers become the defenders. Coach should have all waiting players with pinnies in their hands as the new attacking group entering should contrast in color with the defending group. Coach can have the defending group stay on for 3-4 runs of attack prior to making any switches changing the game from an endless game to a predetermined number of attack before the switch. 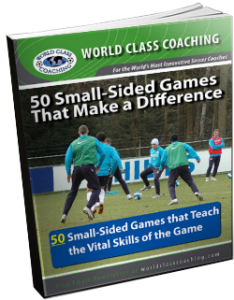 World Class Coaching is offering a free eBook call 50 Small-Sided Games That Make a Difference. Just click the link for more information.